Pave Your Way Blacktop by Mazzoli, Inc.
Hillcrest Landscape Design and Masonry, Inc.
All Island Concrete Pumping, Inc. Comment: Need an estimate on repairing a cracked concrete garage floor. Comment: Concrete Pad 5000 PSI minimum rated hardness, Minimum 5 inch concrete pad thickness, 36 inch x 36 inch, Â± 0.25 inch overall dimensions, Smooth finish on both, top and bottom surfaces, 90Ë right corners with straight side edges. High Tech Enterprises of New York, Inc.
Comet Construction & Landscaping, Inc.
Holtsville Concrete Contractors are rated 4.80 out of 5 based on 465 reviews of 42 pros. 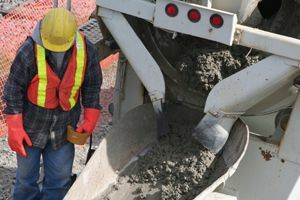 Not Looking for Concrete Contractors in Holtsville, NY?